President of MedCruise, the Association of Mediterranean Cruise Ports, since October 2017 andCommercial Director of the Port Authority of Santa Cruz de Tenerife since 2011. It is a great honor to be elected as a member of MedCruise Board of Directors, as Senior Vice President in charge of Finance and Membership. During this ﬁrst year of my mandate as a member of the Board of Directors of MedCruise and Vice President, I have experienced at ﬁrst hand the hard work that the Association carries out, always for the good of its members. My country and the world are facing rough seas. Our MedCruise association gives a shelter and platform to remain in unity and get stronger with all and each member of the amazing and resourceful region of the Mediterranean and its adjoing seas. Tunisia which gave its name to the entire continent “Ifriqiya” - “Africa” and with more than 3000 years of civilizations is suﬀering since some years from regional geopolitical instability and security issues following the democratical transition of 2011. I am very pleased and honoured to continue being part of the Board of Directors of MedCruise, a unique association oﬀering signiﬁcant tools to promote the cruise ports and their destinations within the cruise industry. MedCruise is a crucial element in the way we do business. We all know how challenging and indeed diﬃcult it can be at times to ensure that we aim for growth. It is comforting to have MedCruise holding our hand on many issues. The environmental issue is a focus very important for MedCruise. MedCruise is a great family, one in which all of us ﬁnd support, cooperation, understanding and help each other grow together, improve our good practice and speak the same language in the ﬁeld of cruises. 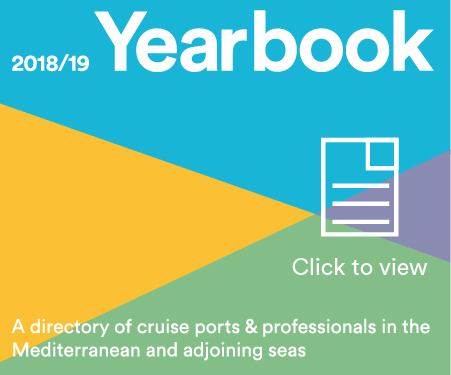 MedCruise has proved to be a valuable platform to gather all the stakeholders of the Mediterranean cruise region and to unite forces to develop the cruise business and promote our ports mainly to cruise lines. It has been a great honor for the Port of Volos and for me personally to be elected in the new MedCruise Board of Directors and to be in charge of European Union relations.